The Seven United Provinces from the best Authorities 1793. 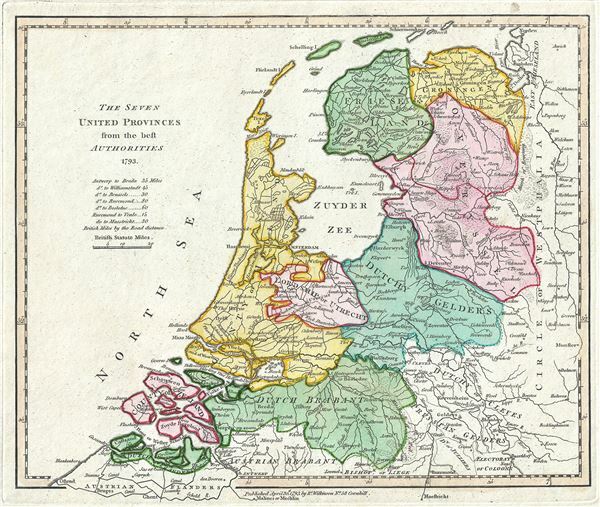 This is a fine example of Robert Wilkinson's 1793 map of what is now the northern Netherlands. It covers from Borkum (Bosch) south as far as Antwerp and east as far as Munster. The 'Republic of the United Provinces' was officially recognized in the Peace of Westphalia (1648), and lasted until two years after this map was made, when Napoleonic forces invaded and set up a new French client state, the Batavian Republic. After Napoleon's fall in 1815, the Congress of Vienna united these provinces with the Low Countries to the south to form the United Kingdom of the Netherlands. The Netherlands, with the world's first stock exchange, is considered to be the birthplace of the modern capitalist economy. A great companion map to Wilkinson's 1794 map of the Low Countries to the south, from the same atlas. This map was engraved by Thomas Conder and issued as plate no. 13 in the 1792 edition of Robert Wilkinson's General Atlas.